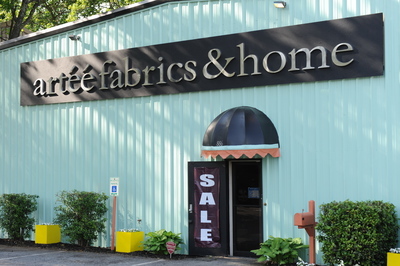 Artéé fabrics & home is the retail division of Artéé collections inc. The retail stores has brought the end consumer, be it a homeowner or a design professional access to the best fabrics, trims and accessories and custom services at a very affordable price. Drawing from our experience in service to the trade and to the customer Artéé fabrics & home can deliver a rich experience in a variety of fabric qualities to suit a wide palette and a budget. Fabrics Fabrics Fabrics .... that is what we are known for. The first retail store took off from an existing fabric store at the Hudson MA location (that was next door to our wholesale operation). That store and all or other stores offer updated lines of fabrics in every category. Silks, cottons, blends, linens, polyesters, blends in solids, plaids and stripes, prints, embroideries in all of the above, upholstery, trims and tassels. The variety of fabrics is endless, most people who visit our stores are pleasantly surprised by the amount of selection that is available, that initially can be overwhelming but later gives you a feeling that your choice was drawn from a really wonderful collection. In addition to our large selection of fabrics and trims we offer a carefully and tastefully selected collection of ready to use window panels, cushions and pillows, pillow inserts and fine home accessories. We have a large collection of furniture displays and pieces that are available for the customer to buy at any time. In addition we have a large collection of accessories, prints and artwork that can add a pop or zing to your room. Artéé fabrics & home offers in each of its stores custom services. A customer can work with trained designed professional in each store to design the room of your dream. From Fabric selection, measuring, design of your window treatment, sofa, bedding, manufacture, ordering and final installation our trained design professionals will work with you every step of the way to transform your space to meet or exceed your expectations. Artéé fabrics & home is carefully stewarded by Arti Bhandari Mehta. She has over 20 years of experience in the home furnishing and textile design. Arti has selected local design professionals to manage each of her stores. These local managers are familiar with local design preferences and styles and work with local artisans and professionals to complete your design projects. Most of your projects are completed locally, using locally trained professionals and labor. From our first store in Hudson MA we have rapidly evolved into a large collection of stores in the East Coast. We opened a brand new store in Pawtucket RI the home of the first automatic looms in the United states (near the Slater mills site). We acquired two of our stores, the Printers Alley stores in Richmond VA and Wilmington NC. We then opened a new store in Virginia Beach VA and then added an existing store in Atlanta GA, Sterling VA and Yorktown VA, and a store that was closed/closing in Metairie LA. We now span a large geography from New England to New Orleans (our Metairie Store).